Bethel Lutheran Church is located at 4925 Farmingdale Rd., Colorado Springs, CO 80917. Phone: (719) 570-9800. According to GPS-derived geolocation (accurate to within 10 meters), the columbarium's coordinates are 38°54'24.6"N and 104°44'05.8"W.
The ELCA church was founded on March 14, 1982, and held its first service in the current building on January 5, 1986. 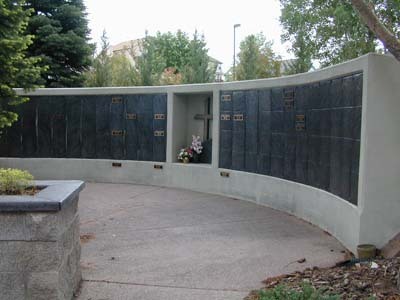 The columbarium, which is a curved wall to the left of the entrance to the church, was dedicated in November 1996.